A generally delightful CD, but one which remains severely wanting in certain respects. As is not always the case, it's the music which is delightful, and certain aspects of the production which are wanting - so we should be grateful that it's this way round. We hear 13 different players, sometimes solo, sometimes with various percussion accompaniment. 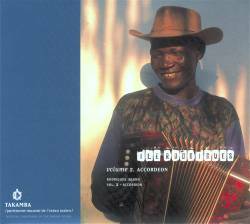 The notes say that the players were asked to play with less, or no, accompaniment because the usual triangles, drums, rattles and assorted noisemaker accompaniment renders the accordion almost inaudible - and that this is not an ethnomusicological record but a CD to enjoy listening to. Whatever your opinion of this decision, at least we've been told about it. The 13 players perform 11 different types of dance tunes, spread among 28 tracks. In addition, the CD is presented in two parts; firstly 19 tracks of different types of tunes, and secondly, a bal accordéon - a recreation of a typical evening dance. Frankly, I notice no significant difference between the two parts - but this is the first time I've encountered sega kordeon. The tune types range from the expected polka, waltz, mazurka (mazoc), schottische (kotis), quadrille and one-step, through the local laval, to the pure sega form. All the dances are fully explained - albeit somewhat impenetrably ... is it ever really possible to describe a dance clearly in words - particularly in translation? We also get a very full account of the bals kordeon which flourished here until quite recently (I know it says bal accordéon as the title to Part 2 of the CD - continuity error between booklet and tray paper). The sociological function of these bals, and of how they were organised, is absolutely fascinating. The playing throughout is of a very high standard - all the melodeonists are extremely nimble-fingered, given that none of them is under 50 years of age. Here's one I rather like - Jacquelin Legentil playing a polka of very obvious European origin. Both the sound clips are typical of the other tracks, so I see no point in adding others - there are no 'stand-out' tracks, except track 12 which might be thought to have found its way here from another CD entirely; a chap singing to a musical bow accompaniment! A minuscule note at the end of the booklet tells us that this was what was danced to when an accordion wasn't available. The 44-page booklet (half in French, half in English) is pretty good, as far as it goes. It offers a great deal about the history of Rodrigues Island and its people - but rather fails to say where it is, other than being one of the Marascene Islands near Madagascar. There is a tiny map, but it doesn't tell you much. In fact, if you can find Mozambique in south-eastern Africa and head due east into the Indian Ocean for about 250 miles, you'll reach Madagascar. Cross it and continue east for another 500 miles and you come to Reunion. Go on for another 75 and you get to Mauritius. A further 500 will bring you to Rodrigues - some 2,000Kms from the east coast of Africa. It's a long way from anywhere! A further, and far more significant gap in the booklet text concerns the people whose music we are listening to; other than their names on the back of the CD we learn nothing whatsoever about them. I would have been happy to see a couple of the note sections condensed (there's a fair amount of repetition) to make space for a little bit about the people whose music we're spending our money on. It would, I'd have thought, been the least courtesy they might have expected - or had a right to.